Dr. Tierney and Dr. Sperling work together at Sperling Neurosurgery Associates to provide the highest clinical standards of compassionate care to all patients seeking essential tremor treatment using Neuravive MRgFUS. The Sperling Neurosurgery Associates conducts Neuravive procedures out of their sunny Delray Beach, Florida office. Many beach resorts and urban amenities of the greater Miami area make this center a popular choice for patients nationwide. Doctors Dan Sperling, M.D, m D.A.B.R.,and Travis Tierney, M.D., PhD, discuss the Neuravive procedure and its life-changing impact on patients. Dan Sperling, MD, DABR, is a globally recognized leader in the use of magnetic resonance imaging (MRI) to diagnose and treat a wide range of conditions. As the Medical Director of the Sperling Medical Group, he has led the Group’s installation of innovative, high-technology focused ultrasound treatments inside the MRI. 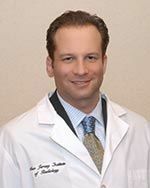 Dr. Sperling is a radiologist certified by the American Board of Radiology, and licensed in New York, New Jersey, California, Massachusetts and Florida. Following his medical degree and internship, he completed fellowships at the Albert Einstein College of Medicine and the New York University Medical Center. Today, Dr. Sperling is the leading pioneer and developer of ablation techniques to treat prostate cancer. He is a published author on over 25 peer-reviewed MRI studies. Dr. Travis Tierney is the Director of Neurosurgery for the Sperling Medical Group. He is the leading developer and pioneer in the use of MR-guided Focused Ultrasound (MRgFUS) for the brain. Not only has Dr. Tierney been a Principal Investigator at the Harvard site of a multi-institution clinical trial of MRgFUS to treat Essential Tremor (ET) but he has also played a founding role in bringing this technology, called Neuravive, to a broader range of patients. For example, as Principal Investigator at another trial, Dr. Tierney and his team are now the first in the world to have applied Neuravive to treat epilepsy. Dr. Tierney earned his MD from John Hopkins School of Medicine. He holds an MS in Neurobiology from Creighton University, and a D.Phil. in Physiology from Oxford University. His focused ultrasound application skills were advanced as Director of Functional Neurosurgery at Brigham and Women’s Hospital. Dr. Lloyd Zucker is a board-certified neurosurgeon who diagnoses and treats all aspects of neurologic illness, specializing in brain and spine. Admired throughout South Florida for his clinical expertise, Dr. Zucker is a Diplomate of the American Board of Neurological Surgery, a Fellow of the American Association of Neurological Surgeons, a member of the Congress of Neurological Surgeons and the North American Spine Society. He serves as Secretary and Treasurer of the Subcortical Surgery Group. Dr. Zucker is active in research and has received appointments as Principal Investigator in neurosurgical research projects in the fields of brain tumor research and neurotrauma. In addition to having published and presented his work, Dr. Zucker continues to train in the newest techniques in advanced brain imaging and minimally invasive treatments. Dr. Zucker earned his M.D. from Rutgers Medical School in 1982 and did his Neurosurgical Residency at the University of Connecticut – Hartford Hospital. He completed a fellowship in complex spinal surgery and instrumentation at the University of South Florida/Tampa General Hospital.